, or Publius Faustus Andrelinus, a modern Latin poet, was born at Forli, in Romagnia, about the middle of the fifteenth century. 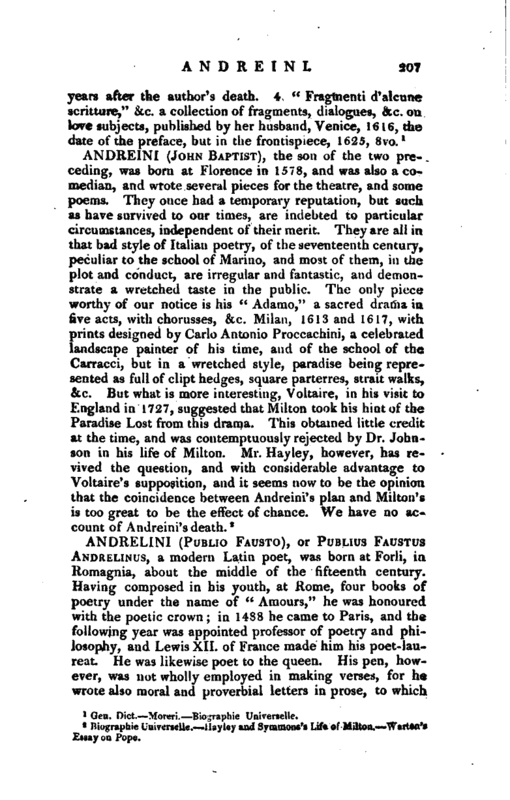 Having composed in his youth, at Rome, four books of poetry under the name of “Amours,” he was honoured with the poetic crown; in 1488 he came to Paris, and the following year was appointed professor of poetry and philosophy, and Lewis XII. of France made him his poet-laureat. He was likewise poet to the queen. His pen, however, was not wholly employed in making verses, for he wrote also moral and proverbial letters in prose, to which | Beatus Rhenanus added a preface, and commends them “as learned, witty, and useful; for though,” says he, “this author, in some of his works, after the manner of poets, is a little too loose and wanton, yet here he appears like a modest and elegant orator.” John Arboreus, a divine of Paris, published comments upon them. 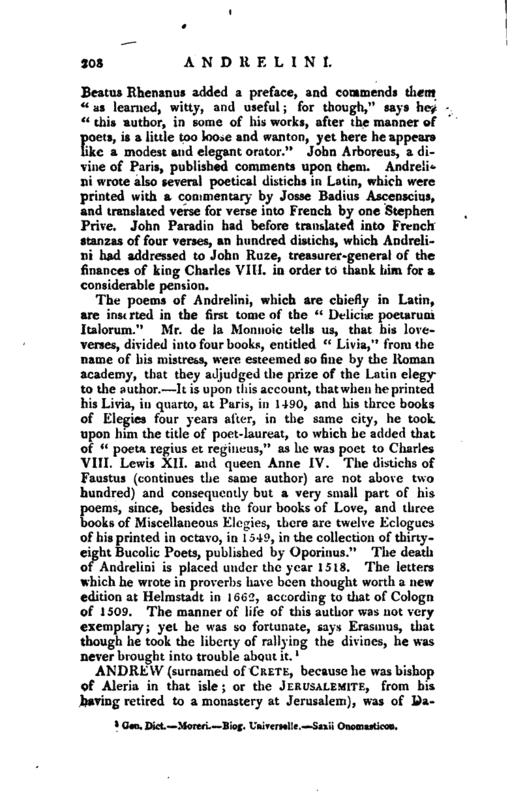 Andrelini wrote also several poetical distichs in Latin, which were printed with a commentary by Josse Badius Ascenscius, and translated verse for verse into French by one Stephen Prive. John Paradin had before translated into French stanzas of four verses, an hundred distichs, which Andrelim had addressed to John Ruze, treasurer-general of the finances of king Charles VIII. in order to thank him for a considerable pension. Gen. Dict. —Moreri. Biog. Universelle. —Saxii Onomasticon.